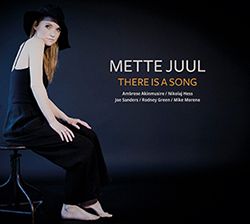 Mette Juul | Jazz singer and songwriter. Mette Juul is currently working on her 4th album. More info soon. For more concerts press calender. NOMINATED for DANISH MUSIC AWARDS Jazz. “affecting delicacy, caressing the lyrics with palpable care…” Jazzwise UK. “Sie gilt als eine der besten Jazzvokalistinnen Europas, was ihr Auftreten und ihre warme, klare Stimme im ausverkauften Jazzclub bestätigte” Bamberg Germany – Live concert. Sign up to be kept updated with tours, releases and news.